Hi everyone! 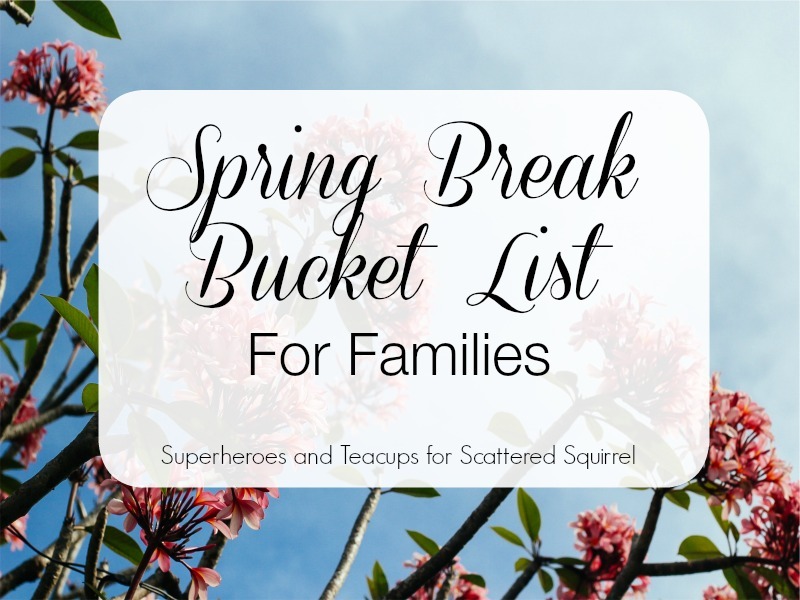 Please join me in welcoming my dear friend Cindy who is hopping over from Superheroes and Teacups, to share with us an awesome way to pack in some fun this spring with a Spring Break Bucket List! I hope you enjoy this post as much as I did. Hello everyone, I’m Cindy from Superheroes and Teacups. I’m thrilled to be here today writing for the readers of my friend Alli’s wonderful site! One of my favorite things to do with my family is to create bucket lists for upcoming holidays and seasons. It’s really just a fun way to list out all of the things we hope to do during that time. I say “hope” because we hardly ever get to everything, but we sure try. It’s that time of year for students to have some sort of Spring Break. For some schools, it’s one of the weeks near Easter and for other schools, its a week half way through the semester. Either way, the children are home and often the parents too and it’s a perfect time for a family bucket list! I included some fun activities on the list, but also some practical ones. They may not be “fun,” but they are necessary to get your family ready for summer. Go to the playground – Depending on where you live, it has probably been weeks (or even months) since your children were able to run around on the local playground. Visit your local zoo – If you have a zoo nearby, this is a great time to visit because the animals will be out enjoying the warmer weather too. Take a walk – Enjoy the nice weather before it gets too hot. Visit a nearby farm – We always thing about taking our family to a farm in the fall, but a lot of farms have events in the spring too. Visit your library and check out some books all about spring – Parents may want to look for some gardening books while there. 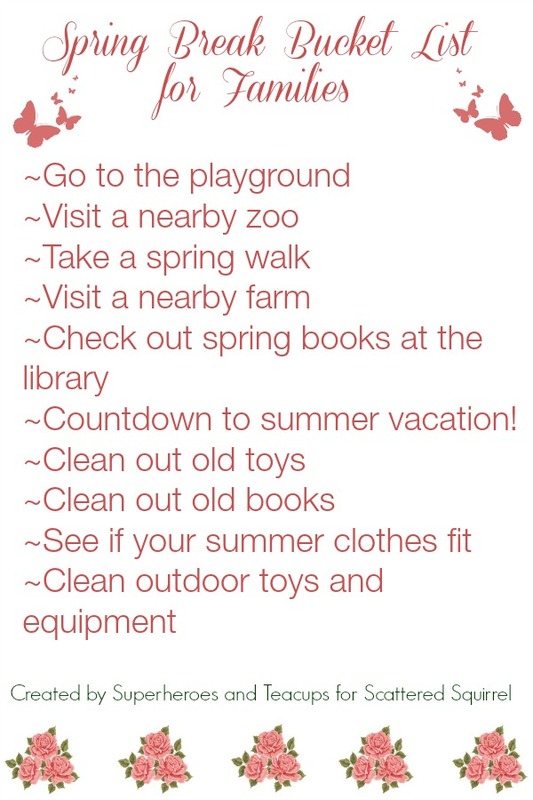 Count down the days until summer vacation – Start planning all of the fun you’ll have when school is out for the year! Clean out old toys – Does your child have way too many toys? (Raises hand) Then take an afternoon to see what toys your child is ready to part with and donate them. Clean out old books – Now, I don’t mean books you’ve already read once. I’m a big fan of rereading books and our family has a ton. But, for example, if you still have a ton of board books and no little one in the house anymore, maybe it’s time to donate those books. Plus it makes room for more! Clean any outside toys – Swing-set, sandbox, balls, bikes, etc. They probably could use a little cleaning up before they are ready to be used on a daily basis. Try on your summer clothes – The sooner you know what you need, the better you can spread out the expense. My boys are growing like weeds and need new everything for this summer! Just in case you would like your own copy of this list, I made a free printable for everyone. What is your favorite thing to do with your family during Spring Break? 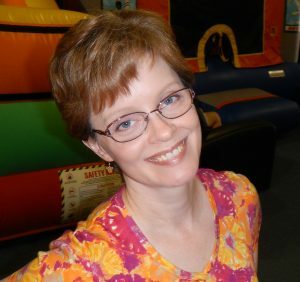 Cindy Howell from Superheroes and Teacups writes about educational activities that parents can use to help their children. She also shares free printables, ideas for holiday fun, family bucket list ideas, and tips for families traveling to Walt Disney World. 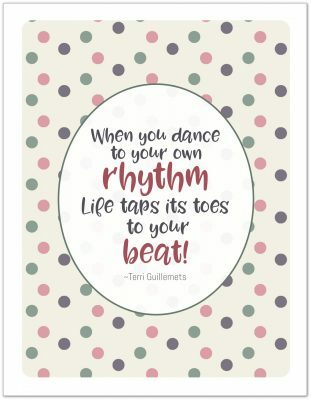 Be sure to follow Cindy on Pinterest for more educational family fun! Previous Post: « How to Use Your Planner to Actually Achieve Your Goals! What fun! I certainly cannot wait for spring. Taking a walk sounds lovely right about now. Plus, I am one of the people who actually like spring cleaning! Oh is it Spring yet??? I love these ideas – can’t wait to get back to our local farm to explore and meet the animals, especially when lambing season starts! I would never have thought of going to a local farm. Cindy has some great ideas doesn’t she? We do live close to a few farms that have sheep and goats, spring is my favourite time to take a walk and watch the lambs and kids playing in the fields. They are just so darn cute. What a fun idea! We got passes to our local zoo for Christmas. Can’t wait to get a lot of use out of them this Spring! What a fantastic Christmas gift! We still haven’t had a chance to check out the zoo in our area, it always seems to get pushed to the end of the list, but I desperately want to go. Cindy put together a great list didn’t she? I’m happy to hear that the weather is finally warming up for you. A maple syrup festival sounds wonderful. I wish they did a maple syrup festival out here.